WHEN Kia unveiled their GT concept back in 2011 at the Frankfurt Motor Show I (like most other motoring journalists) assumed that it would either: (a) never reach production looking like that or (b) reach production but fail entirely to be a viable alternative to offerings from BMW, Audi or Mercedes. Six years later Kia revealed their “Gran Turismo” model and along the way had decided that the name “GT” was too bland a monika for such a leap-forward in their ambitions so instead chose to call their new halo model the “Stinger”. 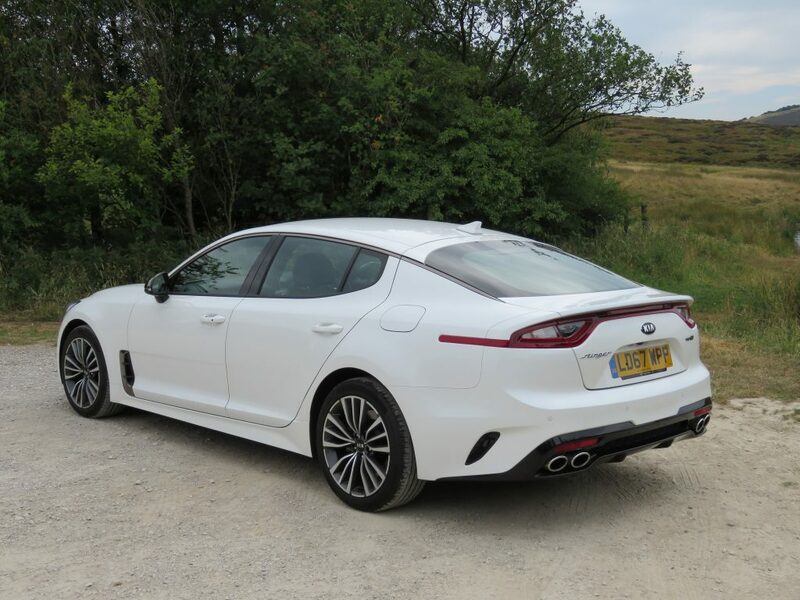 This 5-door, 5-seater, coupe-style grand tourer takes Kia into a new market sector and goes up against the likes of the BMW 4-Series Gran Coupe and the Audi A5 Sportback and is arguably the best-looking of them all. It’s certainly the most striking of the three and immediately put me in mind of the iconic Ford Capri of the 70s and 80s with its long bonnet and sharply-raked roofline. 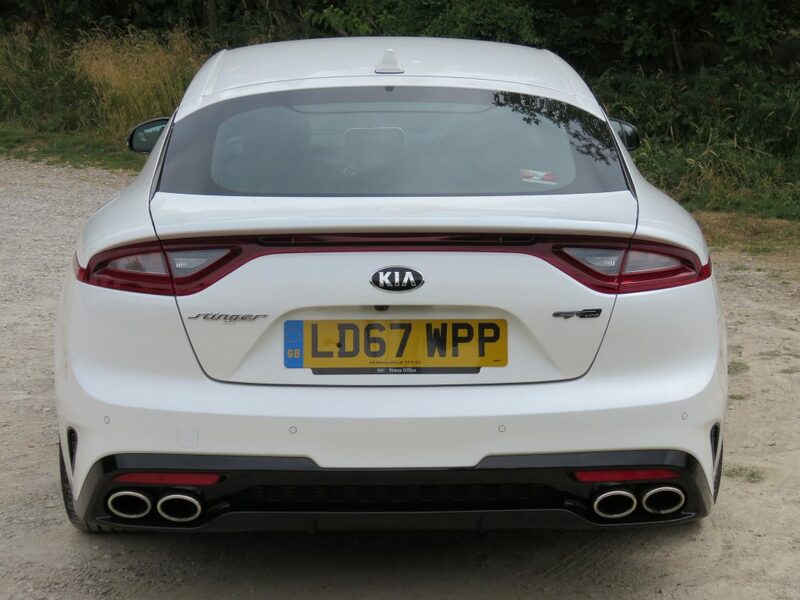 That’s where the retro-vibe stops though as the Kia Stinger features modern aerodynamics that the boys at Halewood could only have dreamt of: Front air curtains, wheel-arch gills, a smooth underbody tray and an integrated rear diffuser all helping smooth the airflow and keep the Stinger planted. There are 5 models to choose from: A 2-litre, 4-cylinder, 244bhp petrol model in either GT-Line trim (from £32,025 OTR) or GT-Line ‘S’ trim (from £35,525 OTR). The same trim levels are also available with a 2.2-litre, 197bhp diesel option for £34,225 or £37,725 respectively. The range-topping GT-S features a 3.3-litre V6 petrol engine, producing 365bhp and will rocket from 0-60mph in just 4.7 seconds and even at £40,535 represents astonishing value for money – if you can get over the badge on the front. Just look at the Stinger too – it stands out in a crowd of BMWs, Audis and Jaguars and is one of those rare cars which actually look better in the flesh. 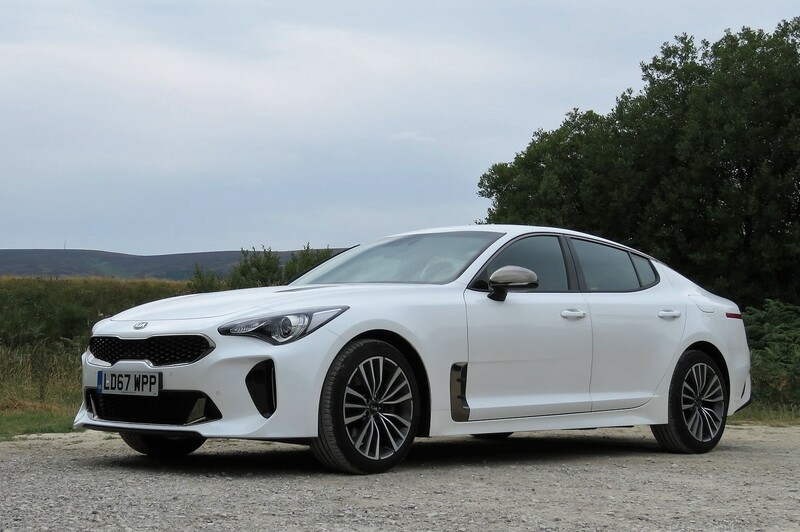 If a Kia Stinger is on your list of “Maybes” I implore you to take a trip to your local dealer and stand next to one – you’ll be blown away before you even turn a wheel. First off, it’s long and sleek with a short front overhang and a longer rear overhang with broad shoulders enveloping smart 18in alloys (19in on the GT-S). The waist is pinched slightly but in profile it’s the bold front-wheel air-vents and the rear wrap-around reflector strip that you notice the most. 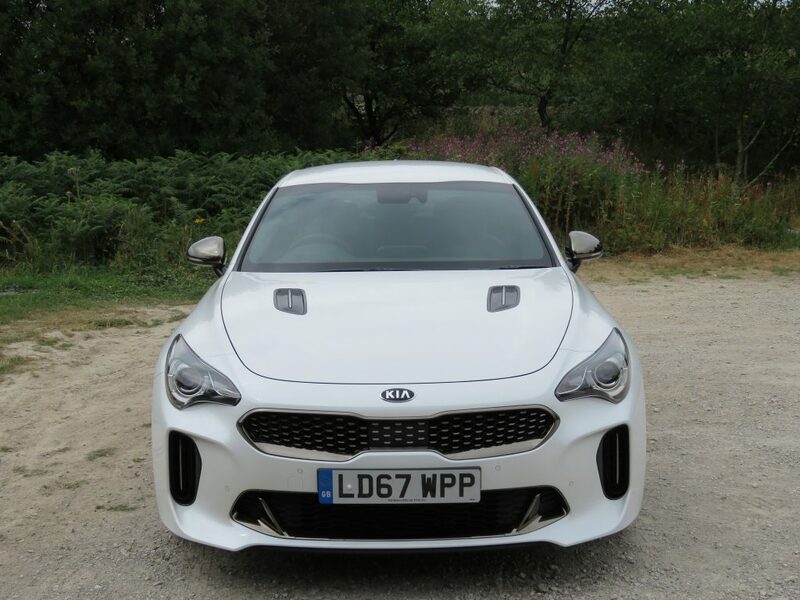 The front has Kia’s signature “Tiger” grille stretches from headlamp to headlamp and below those there are large intakes to aid air-flow through the front wheel arches. Head-on the Stinger looks quite menacing and even more-so with the daytime running lights on. The rear is the best of all with that sloping roof line dropping down to striking rear lights which are connected by a thin strip of arching reflector. The quad exhausts set into the diffuser finishes the look off perfectly. If this was a BMW they’d hear the cooing all the way back in Bavaria . 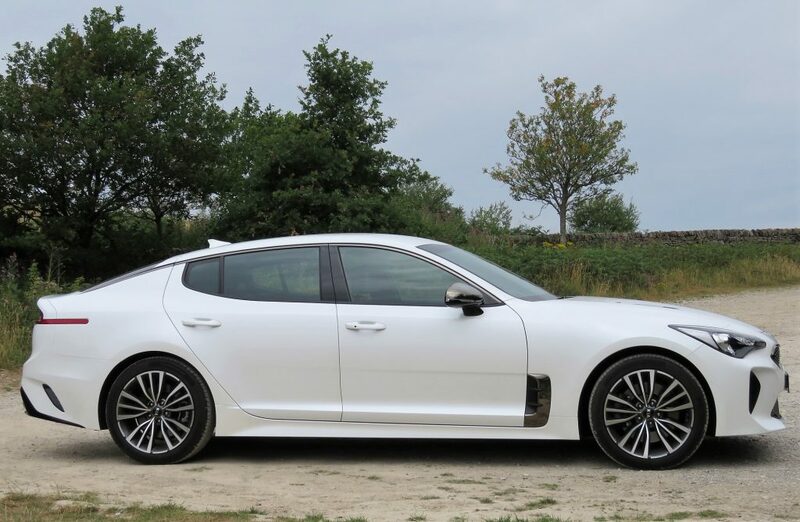 . .
Ok, so the Kia Stinger is a bit of a looker but I can still hear the naysayers claiming that anything north of £30,000 is just too much for a Kia and to some extent I would agree – after all you can have an Audi A5 Sportback for £33,845 or a Mercedes C-Class Coupe for £36,000. You can also be anonymous in those cars whereas you can’t in the Stinger because everyone wants to know what it is and when you mention the word “Kia” they become more interested. 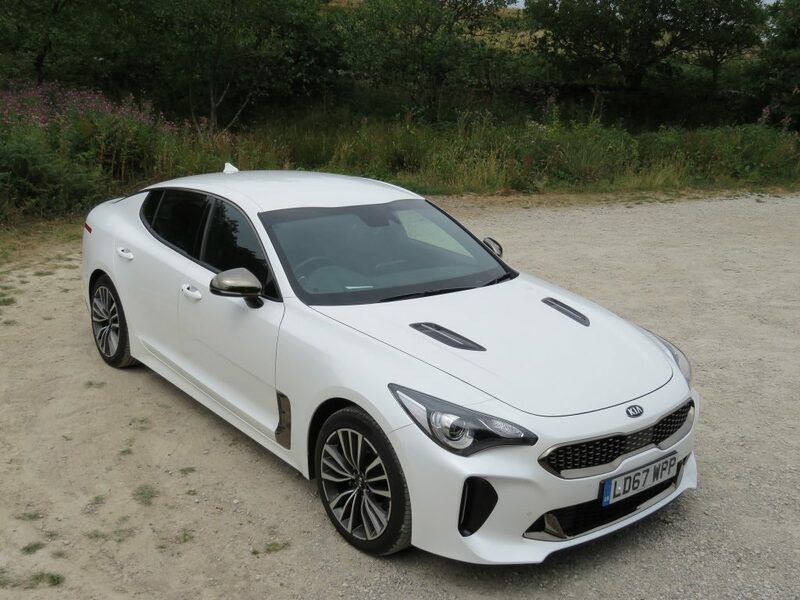 But what could propel the Kia Stinger to the top of your list are the features which are included in EVERY model as standard: 5-doors, an 8-speed automatic gearbox, keyless entry, Push-button Start/Stop, dual-zone climate, heated front seats which are 8-way electrically adjustable with a memory function on the driver’s side, heated steering wheel, all-round parking sensors with a rear-view camera, 8in Touch-screen with Sat Nav, Apple Car Play and Android Auto with Voice Control, Kia Connected Services, Bluetooth with music-streaming and a 9-speaker audio with under-seat sub-woofer. There’s also Auto Lights and Wipers, Adaptive Cruise Control, Lane-Keep Assist, Leather upholstery, Alloy Pedals and even a configurable Head-Up Display. Then there are the Safety and Driving Dynamics which include: A Limited Slip Diff, Speed Limit display, High Beam Assist and Autonomous Emergency Braking as well as the usual Auto Start/Stop, Hill Start Assist and Driver Attention Warning. GT-Line S and GT-S models also get Blind Spot Detection with Rear Cross Traffic Alert, a 360-degree Around View Monitor, wireless mobile phone charger and a 15-speaker Harman Kardon sound system with external amp and front centre speaker. Try optioning all those with any of the Germans and you’ll quickly be looking at £50,000 plus. However, none of that matters if you’re sat in a sea of cheap plastic and below-par switch-gear. 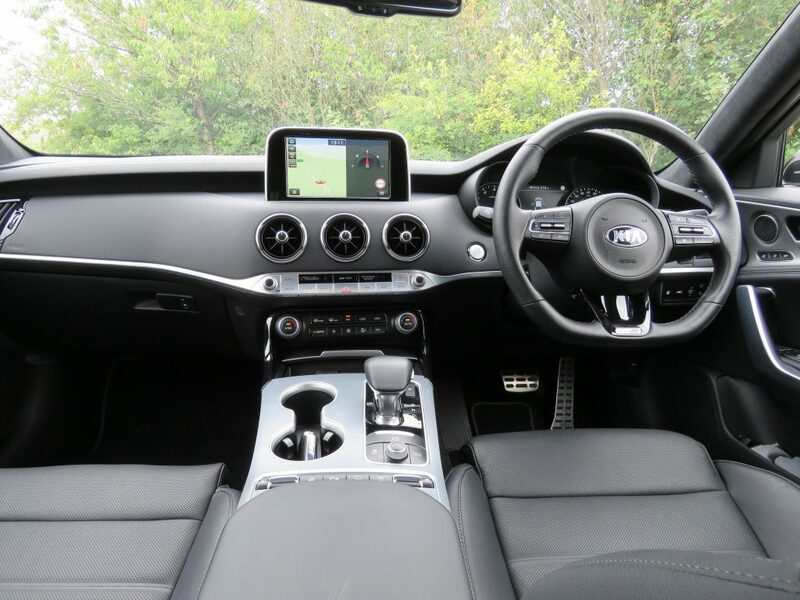 But fear not as the Stinger delivers with an interior that is a league above anything that Kia has produced before, although I won’t go crazy here and say it matches the best the Germans can produce. It really isn’t very far off though and I would say it was on a par with a Jaguar XF for quality of materials and finish. Praise indeed. 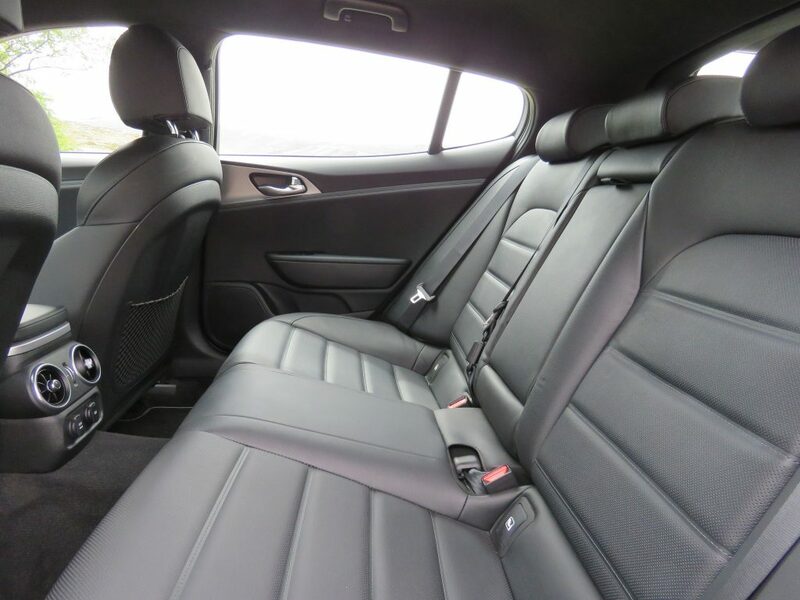 I spent a week with the entry-level T-GDI ‘GT-Line’ model and found the front seats hug you nicely although can be a little firm for longer journeys. The driving position is good and with plenty of adjustment available – including 4-way electronic adjustment for the steering wheel. Visibility is very good out front and to the sides but with that sloping roof-line rear visibility is restricted somewhat. The flat-bottomed, multi-function steering wheel feels good in your hands and I like the chunky gear-selector finished in leather and chrome. 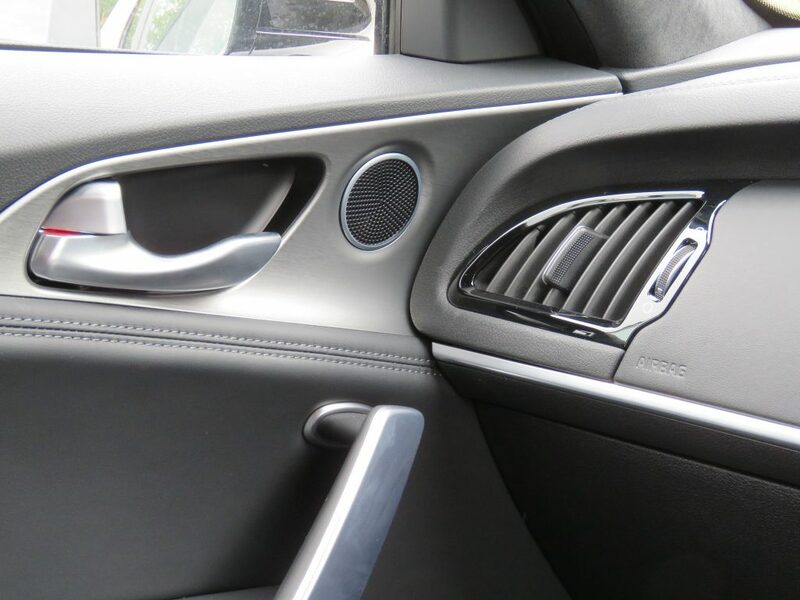 There is chrome to be found on the interior door handles too, while the centre console is finished in a classy Aluminium surround with an aluminium strip running the width of the dashboard and incorporating flush-fitting push-buttons to easily access infotainment functions. 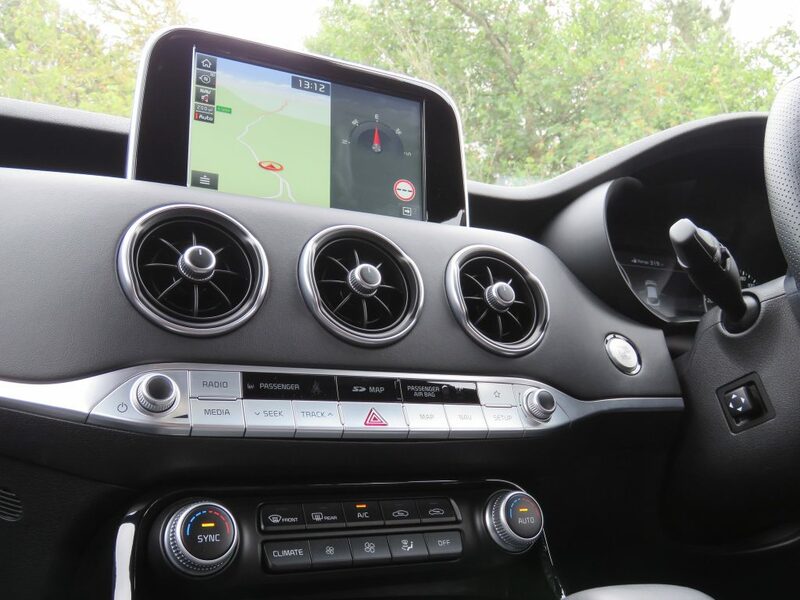 There are 3 rotary-style air vents mounted centrally in the dash which is a little Mercedes-like – as are the interior door handles themselves which sit on an aluminium background. 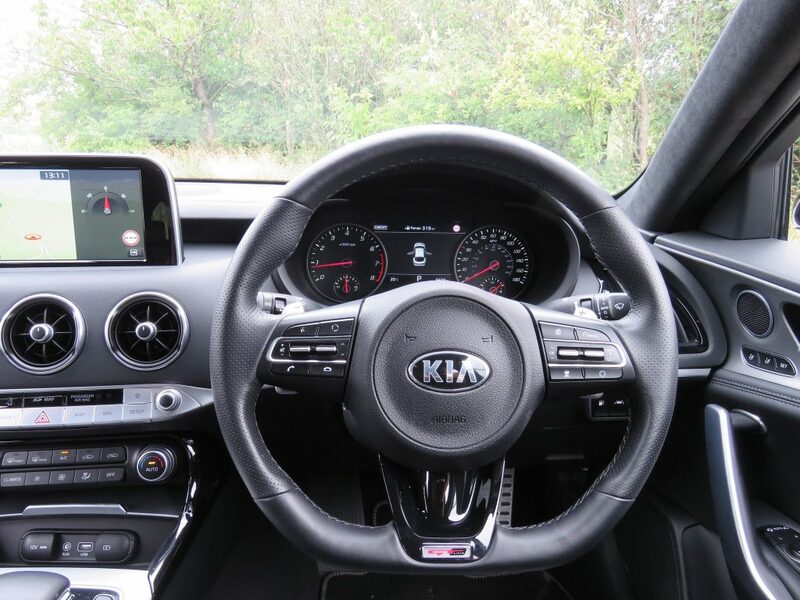 If it wasn’t for the large Kia badge on the steering wheel boss then you could be forgiven for thinking you were sat in a premium-brand executive saloon. 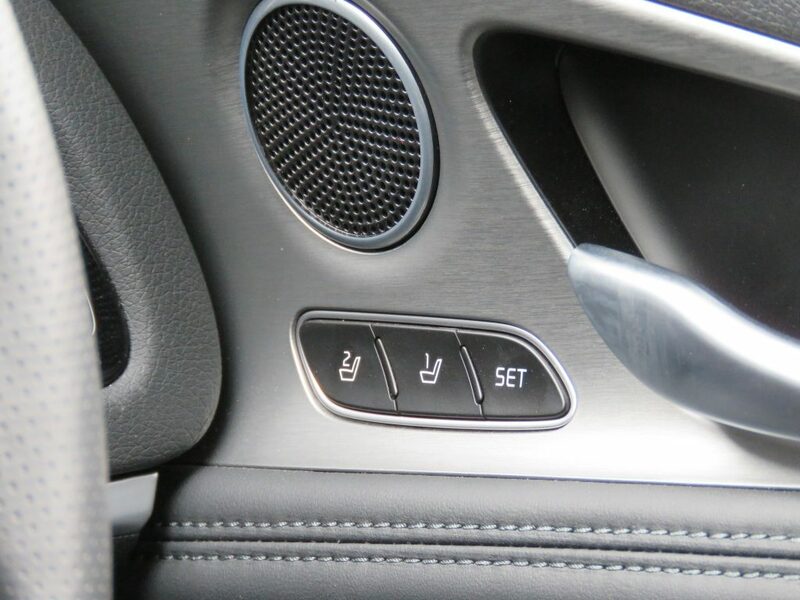 The switchgear feels premium too with even the air-vents having a satisfying “click” when opening and closing them. The 8in touchscreen is responsive and intuitive enough not to cause you any problems and the plethora of configurable options will please the nerd in you. You can even configure the number of clicks the indicators make when you soft-select them. Rear passengers fare well with plenty of leg room. I thought the steeply-raked roofline may be a problem but even a 6ft passenger had no problem as the seats themselves are leaned back somewhat. No problems at all with space in the boot with 406 litres available or 1,114 litres with the 60:40 split rear seats down. Okay, they don’t fold fully flat but there is no protruding lip when folded so pushing larger objects toward the front of the Stinger is no problem. Does this particular Kia have a sting in the tail though? Are the driving dynamics what bring it all crashing back to earth? My journeys in the Stinger were certainly pleasant. 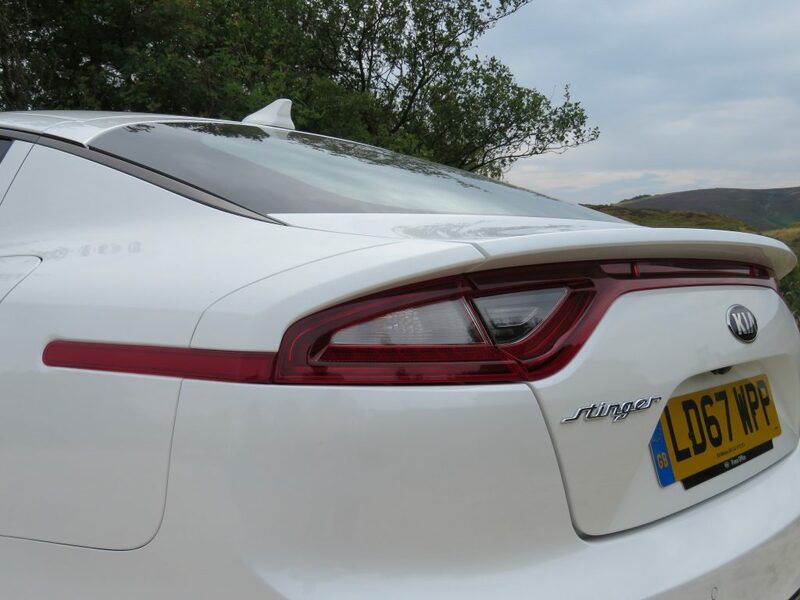 The first thing you notice is that the Stinger is well insulated from road and engine noise – it’s one of the quietest cars I’ve driven recently and that’s why I think this 2.0-litre petrol model will be the best seller. It feels refined enough to hold its own against BMW, Jaguar, Mercedes and Audi. The 8-speed auto box isn’t the quickest to change up but it is smooth and it does allow you trap on a bit when you want. The 2.0-litre is capable of the 0-60 dash in just 5.8 seconds and it does it with no histrionics – in fact, for some, it may sound a little muted despite some trickery through the sound system. 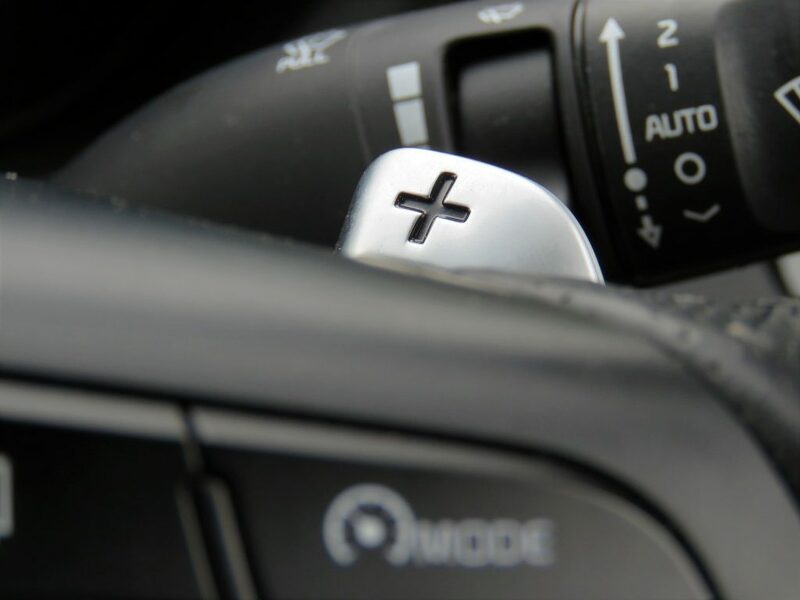 The standard-fit paddle-shifters allow you to feel more involved if you wish. The turbo-charged engine has plenty of poke for all situations and overtaking on the motorway is a doddle so long as you allow for a slight hesitation on the down-shift but I found the Stinger to be just as capable and as rewarding to drive as a Jaguar XE 2.0-litre. It certainly doesn’t appear to have a problem with the state of our roads, riding bumps and scars very well indeed and not being knocked off-line. It may not have the edge on a BMW 4-series when it comes to twisty A-roads but the Stinger feels like a proper rear-wheel drive car in that the power and grip doesn’t compromise the steering which is sharp and grin-inducing. Bottom line is that the Stinger is more than good enough behind the wheel to avoid disappointment. Go see one, sit in it and then take it for a drive. 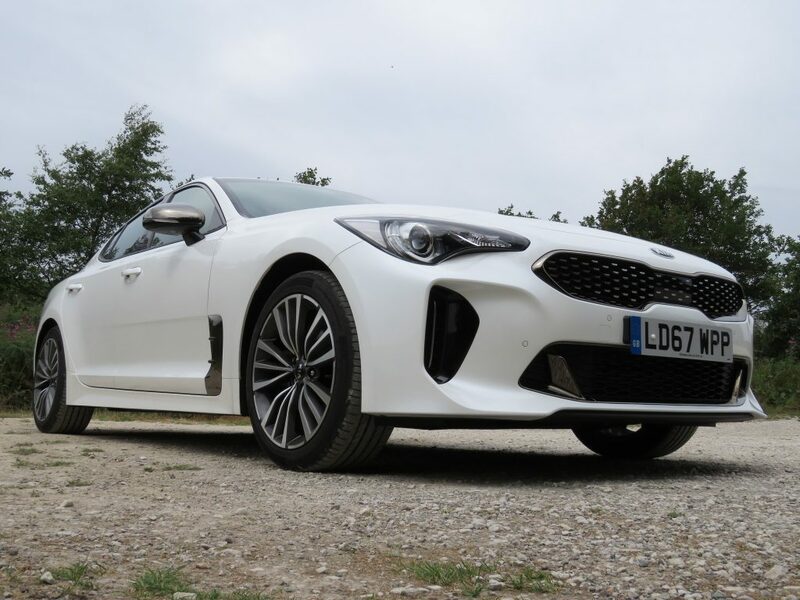 If the Kia Stinger fails to meet your requirements then I’m afraid you may be a genuine, bona fide badge-snob – and that could cost you dearly.